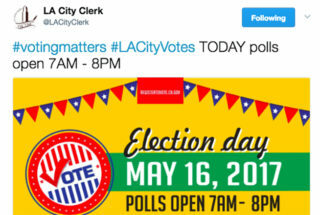 As balloting continued Tuesday for two seats on the LA Unified school board, a few complaints about polling issues in the District 4 race surfaced on neighborhood social media groups, but the Los Angeles City Clerk’s office said no calls had been received about board race problems. As of 3 p.m., only one investigation had been opened, into a complaint in the District 1 race for City Council, said Sandra Mendoza, a public information officer in the city clerk’s office. She said no calls about LA Unified balloting problems had been received, but she encouraged voters who encounter issues to call 213-978-0444. Mendoza had no information on voter turnout as the city does not conduct field assessments during the voting process, as the county had done during the March primary. “We won’t be able to tell until we start counting” this evening, she said. But she reported that as of late Monday, 116,817 of the 866,567 ballots issued had been mailed in and processed, or 13.5 percent. “So there are 700,000 ballots out there that haven’t been returned, you can tell that to your readers,” Mendoza said, urging voters to get to their polling place to vote, or to drop off their ballots at any polling location or in any mailbox as long as the ballots are postmarked Tuesday. Among a handful of complaints was a voter at Paul Revere Middle School reporting there was no signage indicating it was a polling place. Broken machines were reported at Cowan Avenue Elementary and Westside Center for Independent Living. At UCLA’s Rieber Hall one person reported there was no box for the ballots. Some voters complained about their voting places being moved, and others reported very light turnout.